The cast of the Great American Trailer Park Musical at Waterloo East, London. The drama and mayhem of life on a Florida trailer park is brought vividly to life in this UK premiere of David Nehls and Betsy Kelso’s comedy musical. Nehl’s contemporary score is a neatly constructed pastiche of country/rock anthems and sentimental ballads, reflecting the heightened emotional make-up of the characters. The stereotypical trailer park resident has long been an easy target for US satirists and Kelso’s book adds little that’s new to the myths sustained by the likes of My Name Is Earl and South Park. As such, this show unfolds as a one-joke musical that nurtures scant empathy for its target despite the lively score and happy ending. 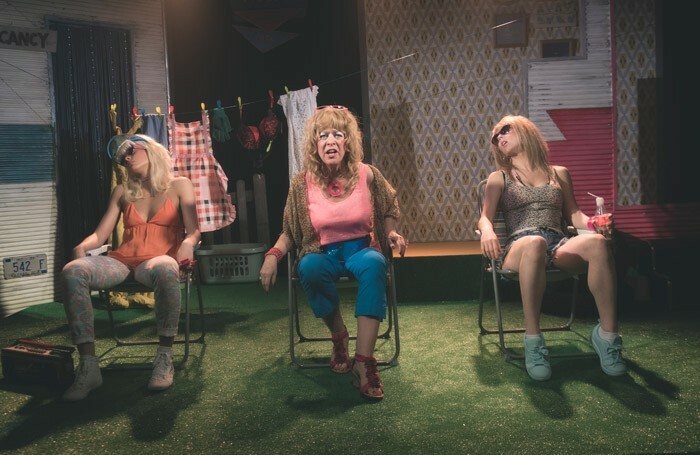 Director Kirk Jameson has gathered an exceptional company for this production including Rosemary Ashe, Michelle Bishop and Jodie Steele as a girl-group chorus of residents in some extremely dodgy wigs, who narrate the central drama. Jameson is undaunted by the intimate space and directs with energy and invention but choreographer Rebecca Howell however rarely rises to this challenge. Sabrina Aloueche as stripper-on-the-run Pippi and Jemma Alexander as agoraphobic housewife Jeanie, both lend grace and style to their respective ballads but either side, the comic devices are hackneyed and the denouement oddly unsatisfying.